Nigerian artist Otobong Nkanga works in a broad spectrum of media, including performance, installations, photography, drawing and sculpture. 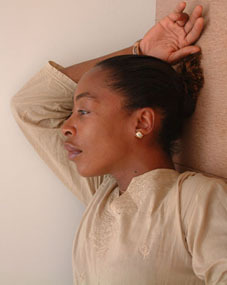 According to Nkanga, the various media she employs “interrogate our mental and physical identities in varied environments and contexts.” Thus taking inspiration from her surroundings, especially architecture, the artist creates work that can be placed in varied environments and are often fragments of a multimedia work in progress: Her oversize needles have been used in many performances and can, as sculptures or installations, be adjusted to whatever space they are exhibited in, while her House Series (2004) drawings suggest a locationless surrealism. Surgical Hit I and II are the first in a series of drawings in which perforations, penetrate — and thereby partially erase — images depicting increasingly intimate spaces. Born in 1974 in Kano, Nigeria, Nkanga began her art studies at the Obafemi Awolowo University in Ile-Ife, Nigeria, and later continued in Paris at the Ecole Nationale Superieure des Beaux-Arts. She has been an artist-in-residence at the Rijksakademie van beeldende kunsten in Amsterdam. Her works have been exhibited in such group shows as the 8th Havana Biennale. Later in July, Nkanga will be shown in the Afrika Remix exhibition at the Kunst Palast in Düsseldorf, and is presently taking part in a residency-commission project to be exhibited at Kunstverein Springhornhof (near Lüneburg) in October.